Why Would Trump Hire Swamp People? RUSH: The left is on this big thing — have you seen the story, Mr. Snerdley? H. R. McMaster supposedly at a dinner party this past summer — it’s BuzzFeed and some other places. Four or five different sources that McMaster was openly telling people what an idiot Trump is, that he has a kindergarten type IQ, that he’s childlike and doesn’t have the intellectual depth to keep up or to understand things. And there are a lot of sources, there are a lot of people here. This is not one or two people anonymously saying this. There are a lot of people. So a lot of people are giving this some weight. And they’re believing that McMaster said it, and then asking why. Why would McMaster do this? I have no idea. I have to tell you, I never heard of H. R. McMaster until Trump hired him. I’ll take you back to when that was. It was before Trump was even inaugurated. It was before Christmas break last year and Trump was down here spending week after week after week at Mar-a-Lago. The Michael Flynn thing had blown up, and Trump had asked for his resignation or fired him and Flynn split, so there wasn’t a national security adviser, a national security director. And when Trump hired H. R. McMaster, a/k/a Mr. Clean — and I say that because of his bald head — I remember the swamp going nuts with praise. I think I even mentioned this on air at the time. They hated Trump then like they hate Trump now, like they hated Trump in 2015, like they’re gonna hate Trump next year. But when he named H. R. McMaster, the Washington establishment applauded and started patting each other on the back and said, “This is a serious hire. This comforts us,” they said. “This gives us a pause. 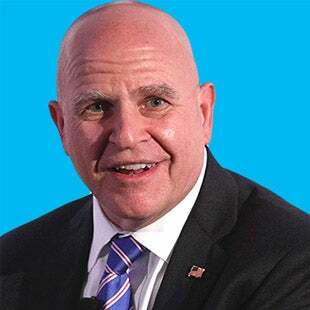 Maybe things won’t be so bad because we’ve got somebody responsible and accomplished from the American military wing who’s been named the national security guy.” That was H. R. McMaster. Now, I had not heard of him, and that’s probably my bad, not having heard of him. But everybody else in the establishment knew who he was. But it wasn’t long after that that the infighting at the National Security Council began. You remember Bannon had a seat there, and that drove the establishment crazy. And there were other people that were pure Trumpists, relatively young Millennial types who were also staffers, and McMaster immediately started making moves to oust them. And at first he wasn’t able to get rid of young Trumpists and Bannon, but eventually he prevailed and got rid of a bunch of them. One of the people he got rid of was a young man by the name of Ezra Cohen-Watnick. It’s a hyphenated last name, Cohen-Watnick. Now, follow this. One of the sources for the story that McMaster told a dinner party that Trump is a buffoon and a kindergartener and an idiot happened to be CEO of Oracle. Oracle is a huge software firm out in Silicon Valley. Larry Ellison is the founder. And he was a close friend of Steve Jobs, and he’s a Republican donor, strangely enough, but he’s not CEO. The CEO, I forget the name. Well, Ezra Cohen-Watnick was the National Security Council staffer, supposedly, that directed Devin Nunes of the House Intelligence Committee, the Republican chairman, to specific intel being held by the National Security Council over at the Old Executive Office Building that contained exculpatory information and intelligence on Trump and Russia and collusion. And Devin Nunes went up and looked at it and then reported on what he had seen, and all hell broke loose. The media and the Democrats and Pencil Neck Adam Schiff started saying, “Well, you can’t do that. You can’t go up there and look at that stuff without us, and you can’t report on it without us knowing about it,” which Nunes of course could do. This led to Nunes having to recuse himself from a certain area of the investigation, but it also led to McMaster getting rid of Ezra Cohen-Watnick, who was one of the young Trumpists very supportive of Trump in the National Security Council staff. Guess where Ezra Cohen-Watnick now works? At Oracle. Landed on his feet, is working at Oracle. I can’t answer that. I can only guess, come up with educated guesses like you could: Trump trying to build a bridge to the establishment; Trump trying to forge a little bit of unity. You know how these things go. People on our side genuinely believe that they can build a bridge to people that hate them and come up with some, even if it’s thin and very shallow, common ground. And it never seems to work out. Now, McMaster is not isolated. McMaster’s mentor and hero is General David Petraeus. And it has long been suspected Petraeus is actually running the national security apparatus with his henchman in there, H.R. McMaster. This is just the scuttlebutt, folks, that I’m treating you to and bringing you in on. There’s no question that McMaster and Petraeus are close. It might also include Mad Dog Mattis, although I’m not sure about that, because he’s supposedly being ripped by McMaster as well. Now, I haven’t seen McMaster react to this or if he has reacted to it or denied it or any of that. I haven’t seen that. But it raises the question: Why are these kinds of people who actually don’t want Trump to succeed in these positions? Well, all you gotta do is go back to the meeting at Mar-a-Lago when Trump announces H. R. McMaster and brings him out and introduces him, and the swamp loved it, the swamp went nuts. Now, if you’re Donald Trump, you’re a human being and for two years they’ve been wishing you would die and then you do something and they applaud you, well, you’d like to get more of that. So we shall see how that all ends up. But it’s a constant battle within the White House and the regime. The point of all this, I believe that Trump is eminently more qualified to be doing what he’s doing than any of these so-called egghead elitist intellectuals. They are the ones that put this country at risk. They are the people of open borders. They are the people that believe in globalism and the abolition of nation states. Trump and what he believes is the, in some people’s minds, the last chance the country has for reviving traditional American values, which are constantly impugned and laughed at and made fun of by the elites. But I think, folks, they talk about Trump’s kindergartener intellect or mentality or whatever, you take a look at Trump’s foreign policy trips and the performance of the U.S. economy, I think it’s typical. These eggheads and these elites, they have been the problem. They’re the people, everything they do is not in America’s best interests, even though they might think that’s what they’re doing. Same kind of people who just know they’re smarter than everybody. They just know it. And when you get down to brass tacks, forget the IQ tests, forget the degrees, forget the so-called education. When it comes to actual common sense and day-to-day knowledge of things, they are so far below their own self-esteem. And this is what leads to their holier-than-thou criticism from on high.